The “Internet of Things” or IoT is the inter-networking and instrumentation of physical devices—everything from streets, cars, factories, power grids, ice caps, satellites, clothing, phones, microwaves, milk containers, planets, human bodies. It is an exciting area of tech, where industry experts estimate that there will be more than 30 billion connected IoT devices by 2020. In an IoT Architecture, data about these devices are collected with the help of various technologies in order to gain real-time insights to facilitate automation. Current market examples include home automation (also known as smart home devices) to control and automate lighting, heating, air conditioning and household appliances, infrastructure management to monitor and control urban and rural solar panels, railway tracks, and wind-farms and manufacturing, where monitoring and control can optimize plant safety and security as well as extend into asset management thus allowing for predictive maintenance that drive efficiencies and maximize reliability. Because of this, the Internet of Things creates an opportunity to measure, collect and analyze an ever-increasing variety of behavioral statistics. That being said, data is central to any IoT implementation, and depending on the application, there could be high data acquisition requirements which in turn lead to high storage and heavy data processing requirements. 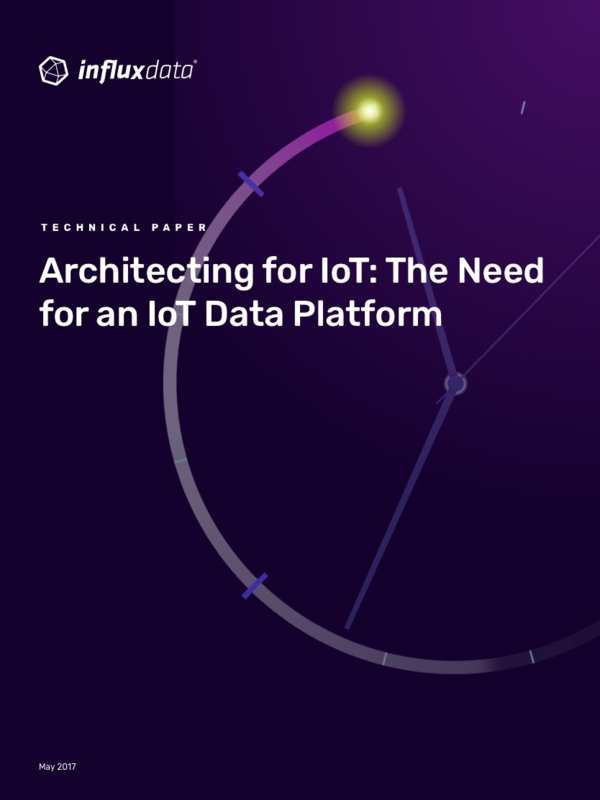 This paper reviews how an IoT Data platform fits in with any IoT Architecture to manage the data requirements of every IoT implementation. It is based on the learnings from existing IoT practitioners that have adopted an IoT Data platform using InfluxData. These clients have a range of solutions–from home automation (thermostat monitoring & management), to infrastructure management (solar panel monitoring and control) to manufacturing (equipment monitoring & control) as well as environmental management (green wall monitoring & control). These learnings will help IoT adopters avoid the common pitfalls current clients faced in their journey to developing their IoT solution.